Over the years, we have seen teenage phenomenons come through and win major titles at incredibly young ages, while we are also now seeing a rising number of players aged over 30 remaining at the top level. 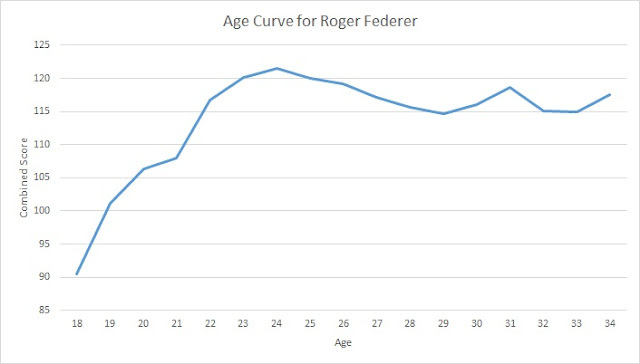 It raises the question as to what exactly is the peak age for a tennis player? 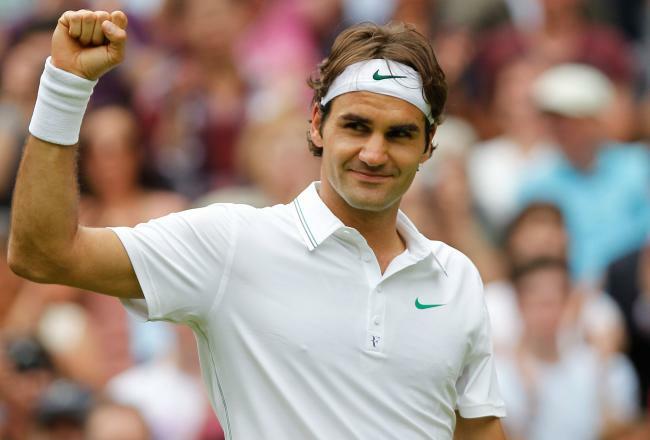 Roger Federer is one of the greatest players of all time, but when was his peak? Using data for every ATP match stretching back to 1991, we can look at answering this question. As a basic starting point, we shall look at a player's combined score as a representation of player quality. The combined score is very simple - it is the percentage of service games held added to the percentage of return games that a player breaks in. Clearly, the higher the score, the better. It is basic for now in that it is aggregated over all the surfaces and it does not take into account the quality of opposition, but it is a decent starting point. By calculating a player's combined score on each of his birthdays throughout his career, we can begin to draw up an age curve for that player. By ensuring that we calculate the score on the same day each year, it should mean that a player has competed in roughly the same amount of matches on each surface, ensuring that this does not affect the data in a noticeable manner. We can see the rapid improvement from his 18th birthday, reaching a peak around the age of 24. That would have consisted of the second half of 2005 and first half of 2006, where he won Wimbledon, the US Open, the Australian Open and lost in the final of the French Open. He also reached the final of the Year End Championships, Masters 1000 titles in Cincinnati, Indian Wells and Miami, finals in Rome and Monte Carlo, plus titles in Thailand and Halle. It seems pretty reasonable to accept that this could well have represented his peak. After that, we see a very gradual decline through until around his 30th birthday where, for whatever reason, he seemed to manage to lift his game again briefly before settling at a relatively constant level. 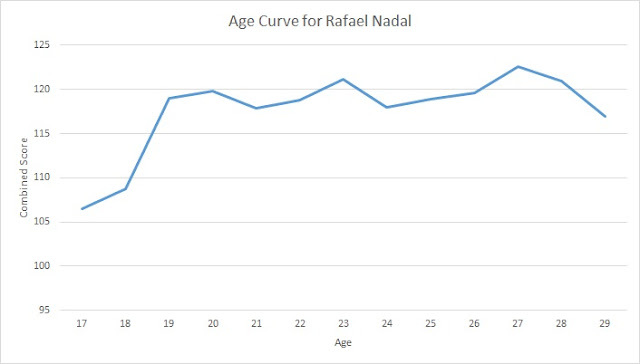 The first thing to note is that Rafael Nadal, at an incredibly young age of 17, immediately appeared on the ATP Tour at an incredibly high level. Consider that it took Federer around four years from his debut on tour to reach a combined score of around 106, where Nadal started. 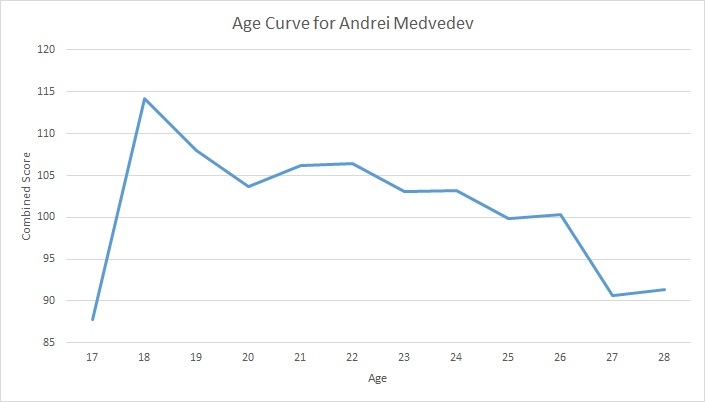 We can see a very rapid rise during his teenage years, followed by a slight fall, before another rise to reach the a combined score of over 120 at the age of 23. There was another slight dip before he continued his rise, reaching his career peak of over 122 at the age of 27. This would have been from mid-French Open 2013 to mid-French Open 2014, during which period he won the French Open and US Open, as well as reaching the Australian Open final. There were also Masters 1000 titles in Canada, Cincinnati and Madrid, plus further titles in Doha and Rio de Janeiro. Since that peak, we can see the period where injuries have really started to hamper the Spaniard and his current level is as low as it has been since he left his teenage years. The first thing to note is that there would have been matches that he played during his teenage years, but, as the data only stretches back to 1991, we cannot model that for now. I will not go into too much detail here, but it is interesting to see the sudden revival during the final year of his career, strongly driven by his US Open success. Medvedev is a curious case as he appears to have reached his peak at the age of just 18. He had one of the highest ratings of any player in the database at 18, but it appears as though that was as good as it was going to get. He dropped rapidly from that peak, managed to stabilise at around 105 for his early twenties, but dropped rapidly again as he passed 26 and eventually retired at the age of 29. 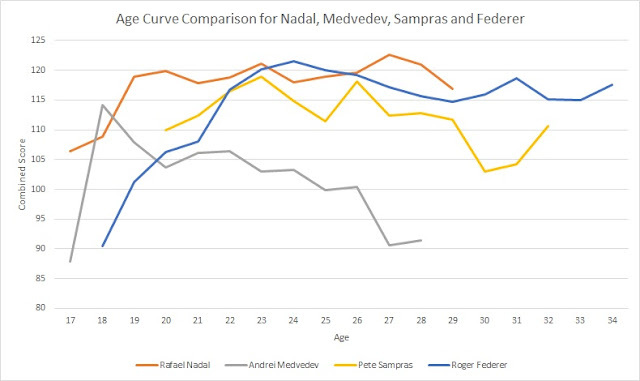 We can see Medvedev's incredible early career spike and how incredible Rafael Nadal was at an incredibly young age. 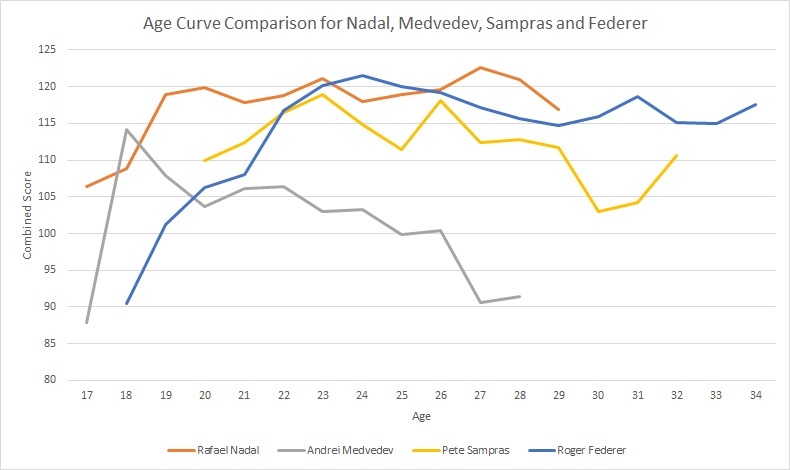 We can also observe that past the age of 22, both Rafael Nadal and Roger Federer were better than Pete Sampras. One final interesting observation is that it would appear that Rafael Nadal's peak is very fractionally higher than Roger Federer's peak. 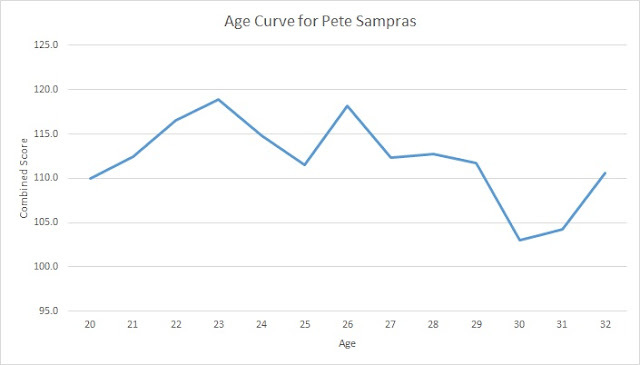 This has been a very basic introduction to the age curve work. However, it will be interesting to see whether we can find any general trends as to where players tend to peak. One thought might be that certain groups of players improve and decline in different ways. For example, we might expect to see players that rely on a big serve (think Ivo Karlovic and John Isner) may well decline far more slowly given that a slight loss of speed and stamina may not affect them, while players that rely more on their speed around the court and dogged returning (think David Ferrer and Juan Carlos Ferrero) may suddenly drop off a cliff as their physical attributes fall. These are all ideas for future work and any further ideas or suggestions around this area would be much welcome and feel free to mention them either on Twitter or in the comments section below. I've done age curves on quite a few sports over the years and they have proved pretty useful.